Colour is spreading into every corner as now, according to the calendars, spring is official. Our surroundings become a painter’s paradise as lush plants vie for attention, their soft edges contrasting with the sharp mountain landscape. 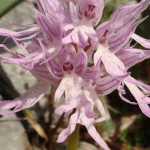 Botanising amongst the orchids is sheer pleasure as more species are appearing in bloom and photographers beware – extra memory cards and batteries are advised! 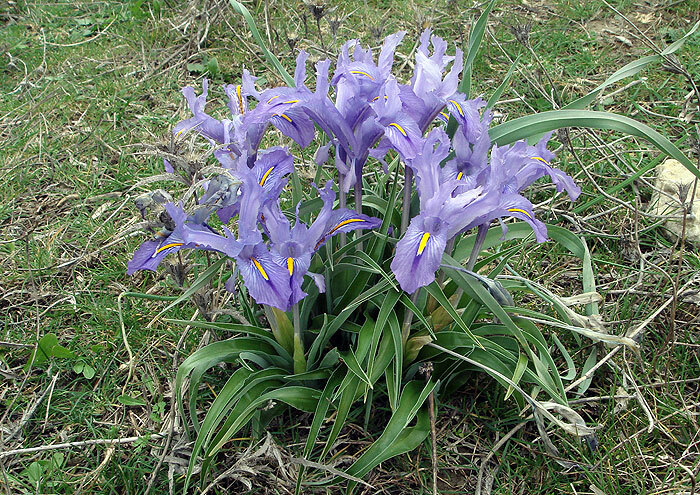 Although this plant is small, the flowers are quite noticeable. 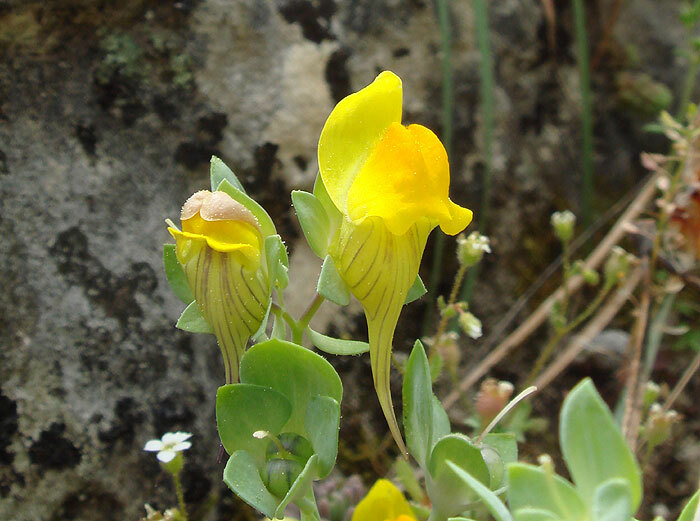 They are bright yellow with a darker colour at the mouth and are often held in clusters. The long, slightly curved, tubular spur at the base has fine pale brown stripes. The leaves begin as a whorl of three clasping the stem but higher up can be paired or singular. It often forms a flowery mat in rock crevices. Distribution: endemic to Grazalema and Ronda. 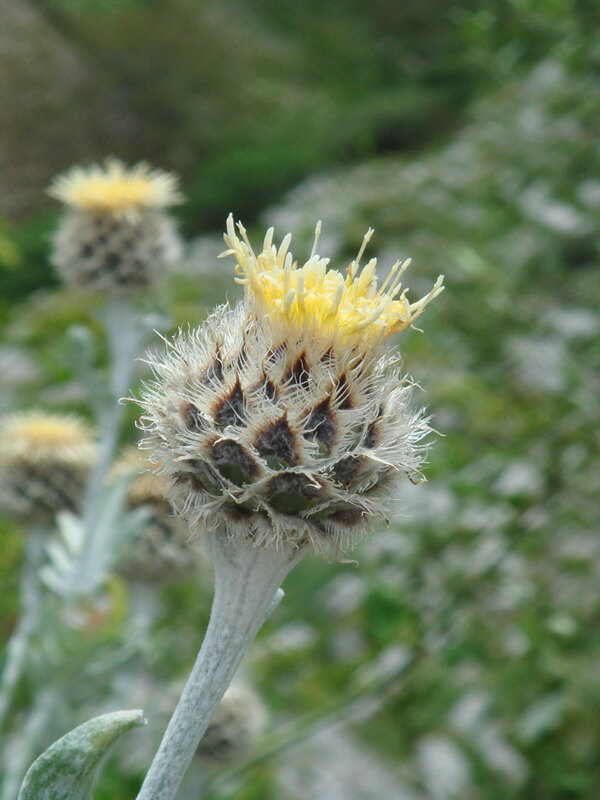 The flowers of this thistle-like plant are a very pale creamy-yellow, surrounded by spiny bracts. They stand tall above deeply cut and decorative silvery leaves. 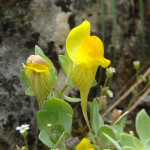 It can be seen growing out of crevices in sheer cliff faces of limestone rock, especially around the village of Grazalema where it also grows in some of the manmade support walls. Distribution: endemic to south west Spain. 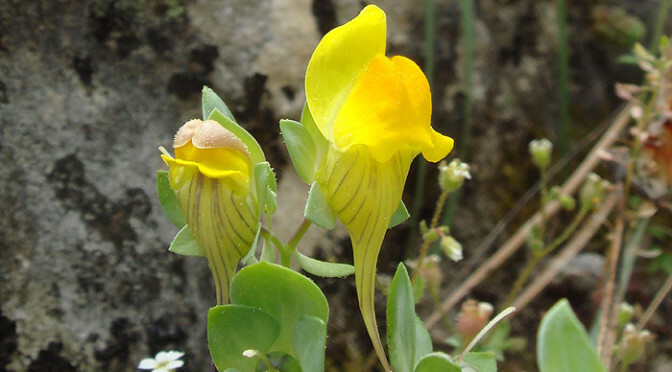 The two-lipped flowers can vary in colour from lemon combined with orange through to red. They are grouped in rings spaced out along a tall, squared flowering stem. The large cut leaves form a dense base, with much smaller leaf bracts adjoining some of the flowers. The flowering stems can be up to 150cm in the right conditions and may vary from single to numerous. 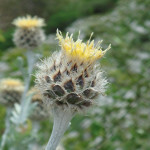 They can be seen at roadsides, borders to cultivated land and in damp areas. Distribution: South west Iberia. A single, delicate flower head is only around 1cm, so is easily missed when residing at not much above ground level. However a group of these tiny yellow flowers with their violet lines are quite striking. Found in high limestone rocky areas. Distribution: South of Iberia, N. Africa. 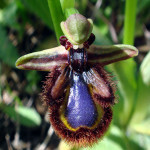 A ‘Bee’ orchid, this one has a very showy metallic blue centre, with a dark brown fluffy trim. The blue ‘mirror’ often has a bright green/yellow outer edge. 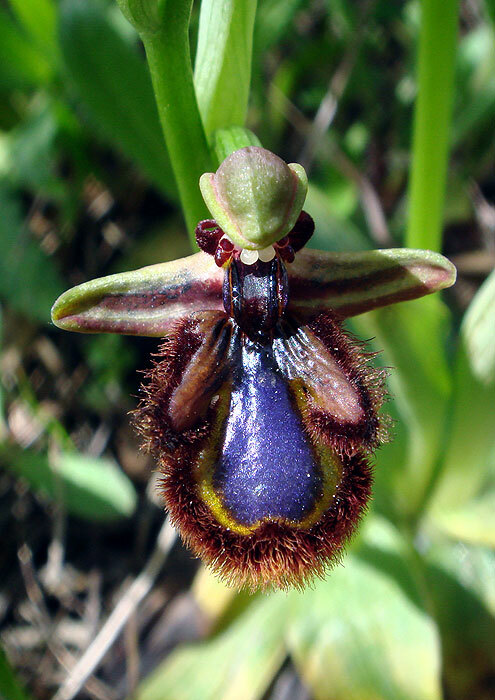 This plant will often be seen in the same areas as the Yellow bee orchid. 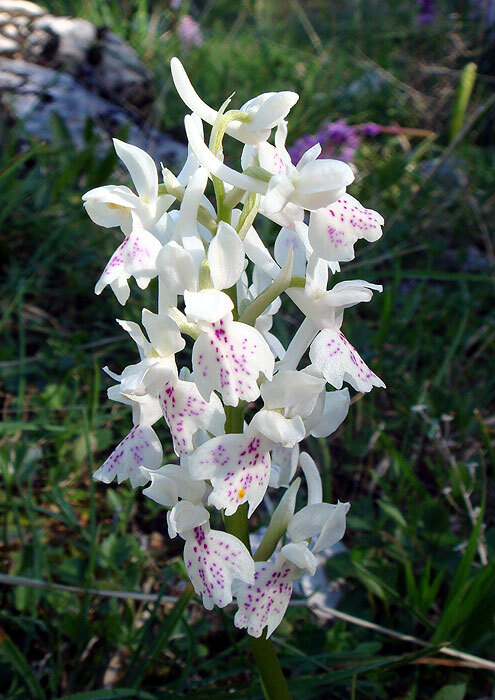 It can be found in open scrub, olive groves, and grassy habitats. Distribution: Mediterranean area. 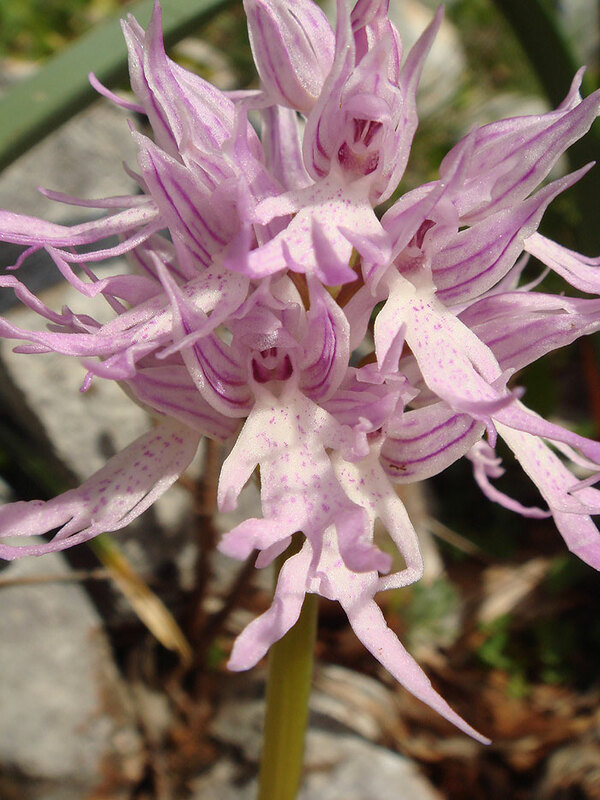 The densely packed flowers on this orchid create a conical, occasionally globular head. 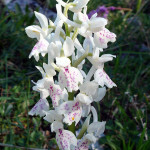 The lower flowers open first, in shades of white through to pale pink, each one looking like a male figure with arms, legs and genitalia. If you look closely, sometimes they have a big clown type grin! This orchid has noticeably wavy edges to the leaves. 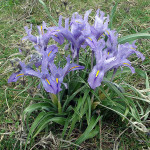 They can be found in scrubland, grassy places, rocky slopes and open woodland. Distribution: Southern Europe, North Africa and southwest Asia.